Hotelogix has been again named as a Â‘FrontRunnerÂ’ by Gartner in its December 2018 report. This makes Hotelogix one of the top 4 hotel management systems, ahead of over 200 hotel PMS vendors analyzed. 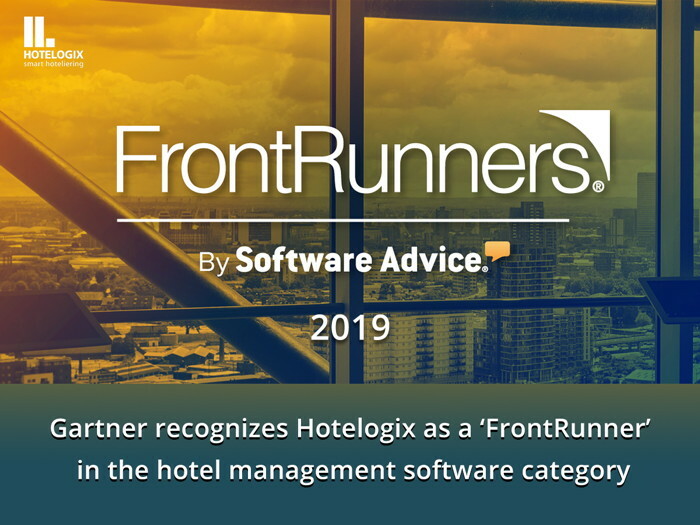 Hotelogix, a leader in cloud-based Property Management Systems has been again named as a ‘FrontRunner’ by Gartner in its December 2018 report. This makes Hotelogix one of the top 4 hotel management systems, ahead of over 200 hotel PMS vendors analyzed. Powered by Gartner methodology, the 'FrontRunners' report was announced on its website Software Advice, focusing on the North American hotel management software market. Software Advice's selection process included two areas of evaluation – the product’s ‘usability’ and ‘recommendations’. With a core set of operationally imperative functionalities in its cloud-based Hotel PMS, Hotelogix serves both independent and chain hotels across the globe. In 2017, Gartner had placed Hotelogix in ‘Masters’ quadrant and it quickly advanced to ‘Leaders’ quadrant in 2018. “In last 10 years, our PMS has grown into a robust and comprehensive hotel software that helps hotels of all sizes and offerings to automate operations, save time, and sell more online. This helps hoteliers make more profits while serving their guests efficiently. We listen to our clients and take their feedback on our PMS continuously to enhance its capabilities,” Prabhash added.